Needlework Tuesday is open to all readers who are interested in any of the various forms of needlework. Leave a comment with a link to your recent post. I love to see what you are working on and will visit and leave a comment in return. This past week was good for stitching. I worked on my mosaic afghan almost every day. Have the first three motifs for row 11 completed. Yippee Looks like I will finish on time and not be darning in ends on the airplane. I haven't decided whether to take a knitting project on vacation; I am taking several balls of specialty yarns for my niece and will be visiting at least one wool shop. That should be enough. Besides, I am going on vacation to visit with my friends and to see the sites. I can knit at home any time. I used my son's old SLR to take a photo this week. Turned out much better. Must be all the detail that it was too hard for the other camera to decide where to focus. 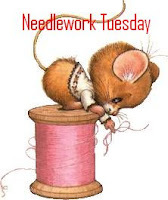 Do you knit or stitch when you are away? Are you one of those people who keeps an 'on the go' project? 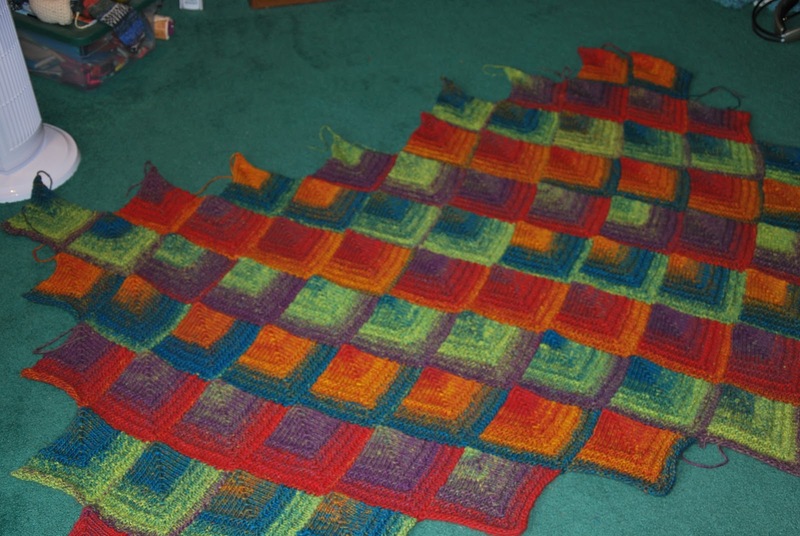 Last year I was working on an afghan that had small bits that were later worked together and it worked well to carry around, but a large project like this would be unmanagable. Wow, this looks fantastic. I just love the colours. Thanks for stopping by Carole's Chatter and taking the time to comment on my prawn cocktail post.